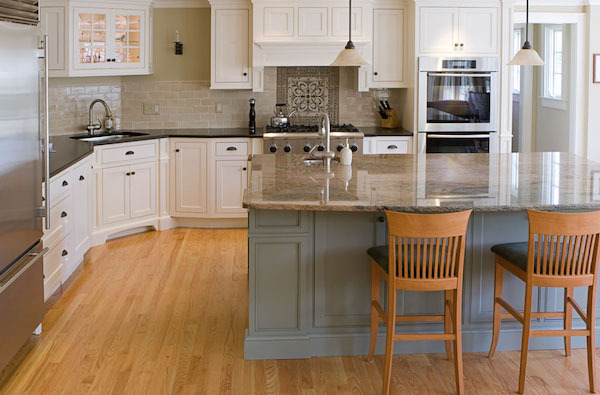 Homeowners have many important questions about their Floor Remodeling Project. How much will it cost? How long will it take? What problem areas do I need to watch out for? Can I recover my Floor Remodeling investment when I sell? Get Great value and Return on Investment by Remodeling Your Kitchen. Let’s face it, the kitchen is where you spend a lot of time preparing, cooking and sometimes even eating your food! Like bathroom remodeling and replacement windows there is a big upside for cost vs. value if you ever resale your home. Kitchen remodeling Company Chicago Pros, as we are often called, not only will provide you excellent customer service but more importantly – we will ensure you get great value and return on investment. Learn more about other remodeling services we offer. There are several ways our Kitchen Remodeling Company Chicago Experts can layout the kitchen design for your Suburban Chicago Home. When laying out the kitchen remodeling design, try to use the “triangle” method. This involves the fridge, sink and stove being in somewhat of a “triangle” shape. Think of the flow of getting vegetables out of the fridge, rinsing them off, then putting them into a pot on the stove. This will help you envision the “triangle” of work flow within the kitchen. Also keep in mind to leave plenty of counter space beside the sink for cutting of vegetables, stacking the dishes, etc. A dishwasher in close proximate to the sink is also helpful. You should also try to keep plenty of counter space around the stove when planning your kitchen remodeling project. This is for dishes, pans, and things needed for stove top cooking. We have outstanding track record and references. Because we provide outstanding quality work and excellent customer service experience time and time again, our customers reward us with positive reviews. We invite you to take a look and read our customer reviews on Angie’s list and if you are a returning customer of ours, we would love to hear from you. Please share your experience. This is our second project with Sunny Construction and Remodeling. It was time to update our kitchen. I hired Rafal to update our cabinetry, install new quartz countertops build new island and redo tile. As always, project delivered of highest quality. thank you. Highly Recommend! !